One year ago, on July 7, 2014, Israel began an assault on the Gaza Strip that would last 51 days. While a permanent ceasefire was brokered between Hamas and Israel on August 26, physical safety and freedom of movement continues to be denied to the people of Gaza. The already rapid deterioration of the economy and infrastructure was only hastened by the seven weeks of aerial bombardment. As of May 2015, 80% of the population in Gaza relied on international aid, mostly just to put food on the table. The massive displacement of people in Gaza coincides with a shortfall in funding for UNRWA, the UN agency responsible for Palestinian refugees. The group’s resources have been stretched to meet the massive surge in humanitarian need caused by violent conflicts throughout the region. In June 2015, UNRWA was forced to close its shelters in Gaza and has been unable to fulfil many of its promises of cash allotments to internally displaced families there. A recent report by an independent commission working for the UN Human Rights Council found ample evidence of possible war crimes committed by Israel, and the council voted to adopt the report and condemn Israel’s actions in Gaza. 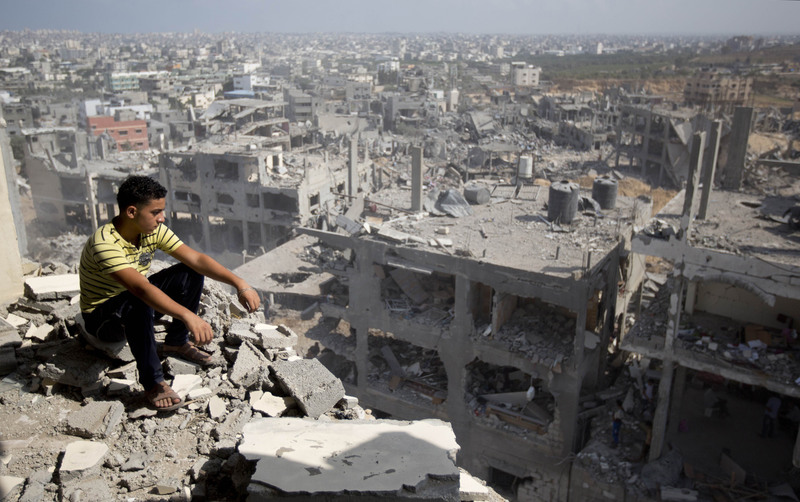 But there is no indication that Israel will be held accountable for the devastation it wrought on Gaza through its blockade imposed since 2007, which it continues to impose. The terms of the ceasefire last August were never made public. But it reportedly promised an easing of the closure of Gaza’s borders and the naval blockade on Gaza’s sea, as Israel has agreed to in the past. Statistics compiled by the UN Office for the Coordination of Humanitarian Affairs (OCHA) and Oxfam suggest a slight easing of the closures. Israeli organisation Gisha has noted that senior Israeli officials — including Prime Minister Benjamin Netanyahu and former and current chiefs of staff Benny Gantz, Gadi Eizenkot and Major General Yoav Mordechai — have publicly acknowledged the need to allow Gaza to rebuild, in order to maintain stability. Here is a brief breakdown of the situation, one year on from the war. Figures reflect an overall easing of the crossings with Israel, but following some attacks on Israelis by Palestinians in the West Bank and recent violence in northern Sinai, Israel curbed all transit through the Kerem Shalom commercial crossing and cancelled many permits to cross through Erez checkpoint, demonstrating that Palestinians are collectively punished for things they have no control over. Exports of produce and some furniture have seen an increase from last year, but still remain at around 7% of pre-blockade rates. After barring all produce from exiting Gaza for the last eight years, at the end of 2014 Israel allowed limited shipments to reach Israeli and West Bank markets. However, the cost of exporting is prohibitively high for many small-scale farmers. The rate of movement through Israel’s Erez crossing has doubled from last year. However, that figure represents a mere 2% of the number permitted to cross before the second intifada. OCHA reports an overall increase in the number of medical patients being allowed access to hospital facilities in the West Bank and Israel, but notes the number of rejections has also increased. Since March, the number of trucks carrying essential reconstruction materials allowed into Gaza has increased. But Oxfam says this amount is still only a quarter of what was permitted before the blockade. Notably, Gisha states that half of the building materials that were allowed in were dedicated to building a road financed by the Qatari government that connects Rafah to Gaza City. At the current rate, the Shelter Cluster estimates it will take 19 years to rebuild the 19,075 homes that were destroyed during the war. Not a single one of those homes — 12,620 of which were totally destroyed — has begun to be reconstructed. But building material is also needed to accommodate the growing population of Gaza that has been denied the necessary materials for eight years. In reality, only 1% of the materials needed is entering — leading Shelter Cluster to estimate it will actually take 76 years to rebuild the tiny piece of land. Finally, not one of the 20 schools that were destroyed by Israel has been repaired. Gaza has prioritised the reconstruction of destroyed hospitals and water and sanitation systems, but these efforts are also significantly delayed and inadequate. Israel damaged Gaza’s already deficient water and waste water systems, effecting up to 30% of the population’s access to running water. While a large portion of the water system has been repaired in the last year, the fixes were quick and short-term, according to OCHA. Across the Gaza Strip, 120,000 people now have no access to the municipal supply of water. Finally, there has been no respite for Palestinians in Gaza from violence or the threat of violence from Israeli forces. Israeli military and naval forces have fired into Gaza and on Palestinian fishers at least 739 times since August. Fishers are fired on within six nautical miles of Gaza’s shore more than once a day, on average, as are Palestinian farmers and residents near the boundary. In recent months, 23 airstrikes have been carried out on Gaza and Israeli military vehicles have made 23 incursions into the border area.